Proxy WARNING! : This game uses proxies. Some of the models in these armies weren't available originally, so conversions were done, or new replacements have not yet been purchased. If this offends you, please skip this battle report. I will point out which models represent their actual game equivalents..
We are working on making some better proxy's for the flyers. 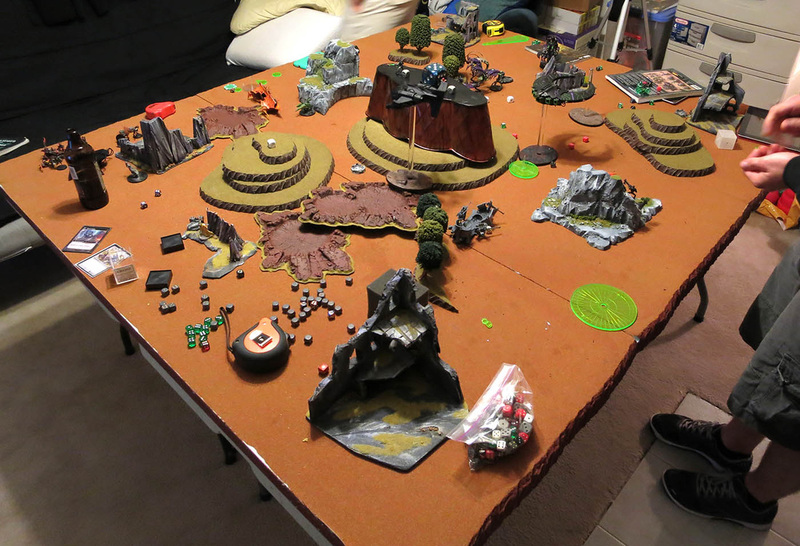 Didn't' expect Macathu to run 3 (now wants to run 4), so will probably start making some out of foam core/flying bases. This particular board is wider then a normal 4x6. It's actually 5x6. 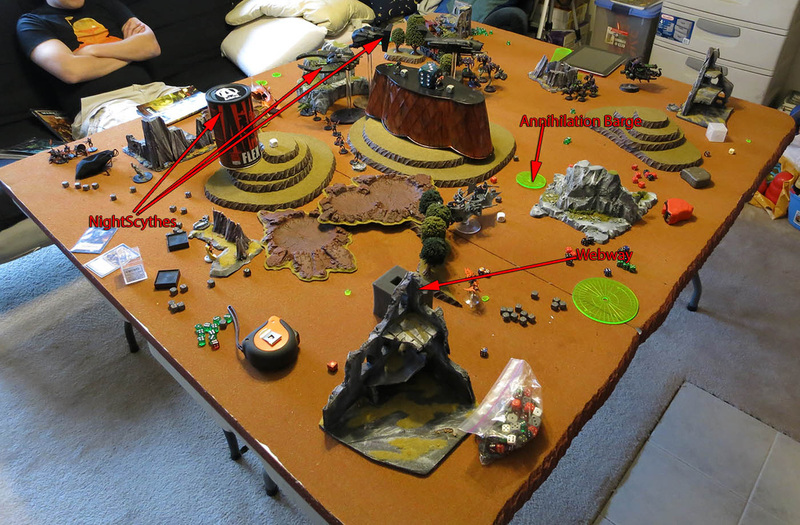 The red marked areas indicate a "dead" zone off the play area. We rolled off to see who would place the last crusade objective. Macathu won, and placed the 3rd one on the bottom side. I failed to notice he had played one of his emperors will objectives out of his deployment zone...so mistake one for this bat rep! 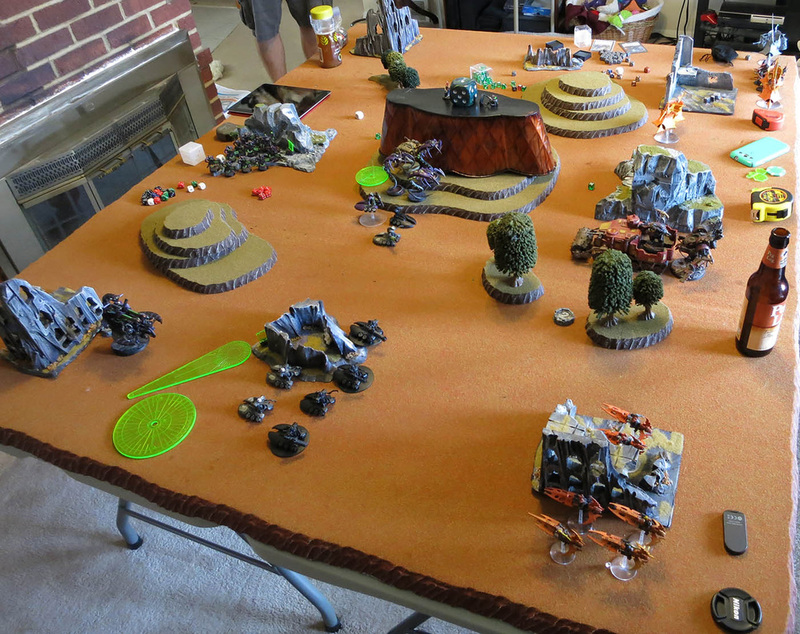 The necrons deployed heavily on the left side, with almost no forces on the right. With a majority of his troops in air transports, he was going to push hard on one flank. 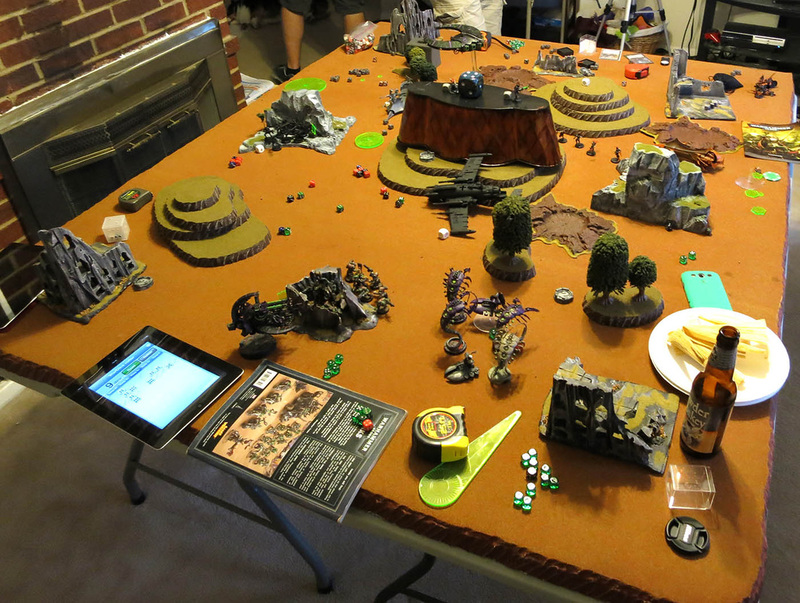 I deployed my strongest CC unit to counter deploy, with the deff dread hopefully acting as a speed bump. I kept the dakkajet and second battle wagon in reserve. (fun list, not really competitive by any means). 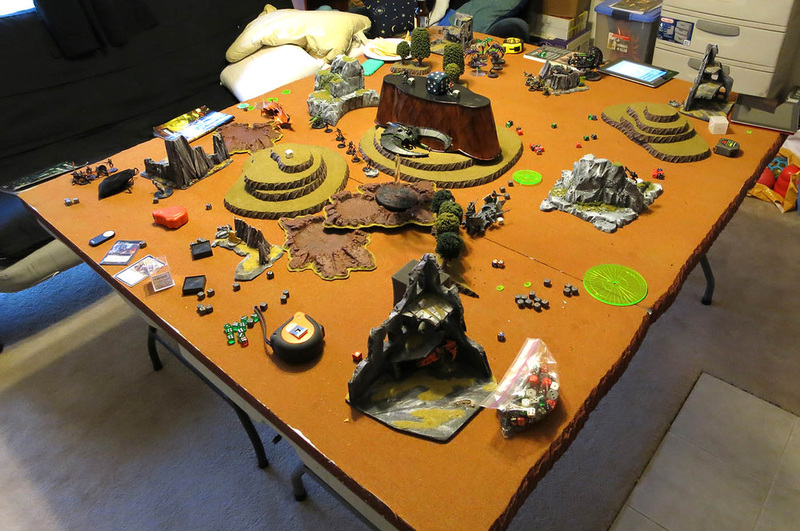 Shantz (my ally for this game), setup his bikes for their famous runs across the board, now putting them in a larger unit of 6, instead of two groups of 3 for better surviability. We are finally getting the rules right on these guys (didn't even realize they had skilled rider before), so they do a lot better this game. His reserves are a unit of wyches in a raider, ravager, and razorwing. We messed up with proxies this game, and I apologize. I normally try to make sure we have some decent proxies for units we don't have yet, but was unprepared for Macathu's list. 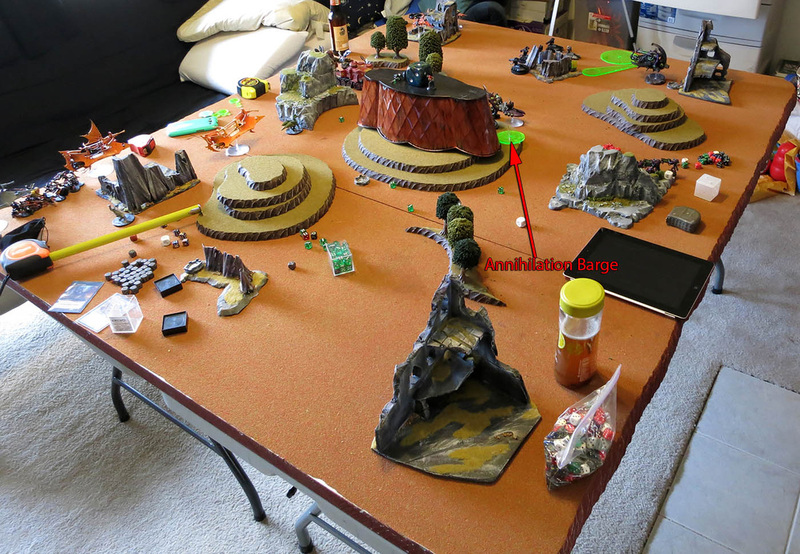 As such, this little green blast marker with a stand sticking out of it, is another annihilation barge. Next time we'll have something that approximates the size a lot better...as this caused us no end of misery during the game. (We kept forgetting about it, he kept remembering). Using all the cover! 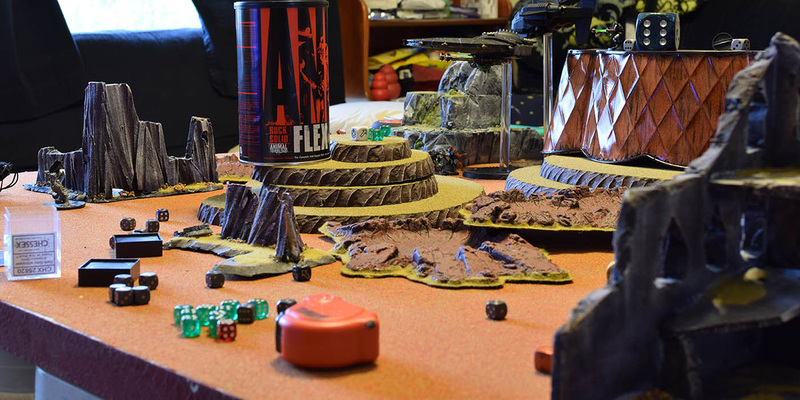 Always go by the thought that more terrain is much better then less terrain. Really showcases the power of mobile units. I'm going to try something new this bat rep, and put a little blurb about what I was thinking tactics wise in the various subsections. Macathu moves up aggressively, creating fire lanes with his two annihilation barges. 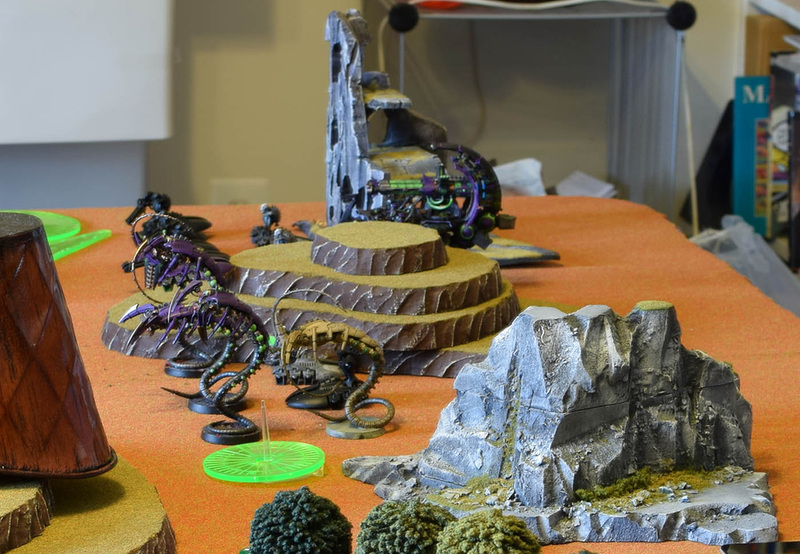 The wraiths move up exactly enough distance so that the battlewagon can't deff rolla them. He holds a strong unit with immortals on his backfield objective, with a lord holding a res orb. On the other side of the board, there is almost no activity. Ten strong Gauss immortal group, with a fully kitted out Overlord. Going to be hard to dislodge this unit. Overview of the fire lanes and rear board. Shantz zips his bikes into turbo boosting position. I shift my battle wagon up, and adjust the deff dread to block it's side from incoming fire. The raider moves up to slowly flank the rear lines. 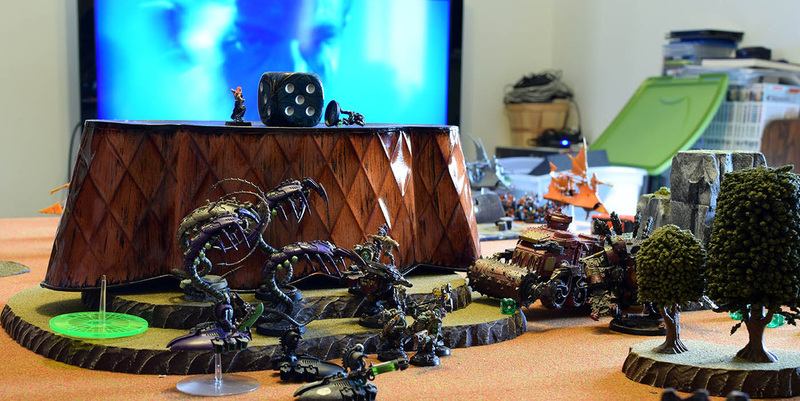 The meganobz and mega-armored warboss (warlord) disembark to assault the wraiths that got a bit too close. 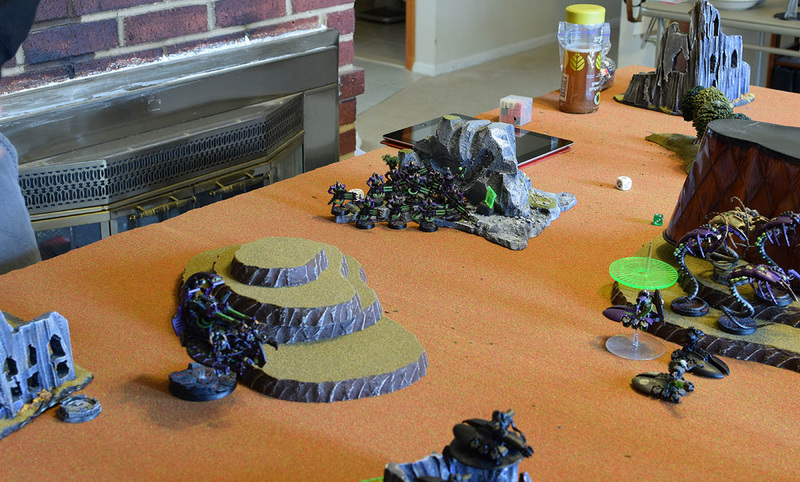 The lord is positioned at the back of the wraiths, so I know I'll get at least one turn without mindshackle. The raider takes a pot shot at the back barge, no effect. The battle wagon misses. The megaarmored nobz and warboss don't do any wounds. The bikes zip over the wraiths and put a wound on them. 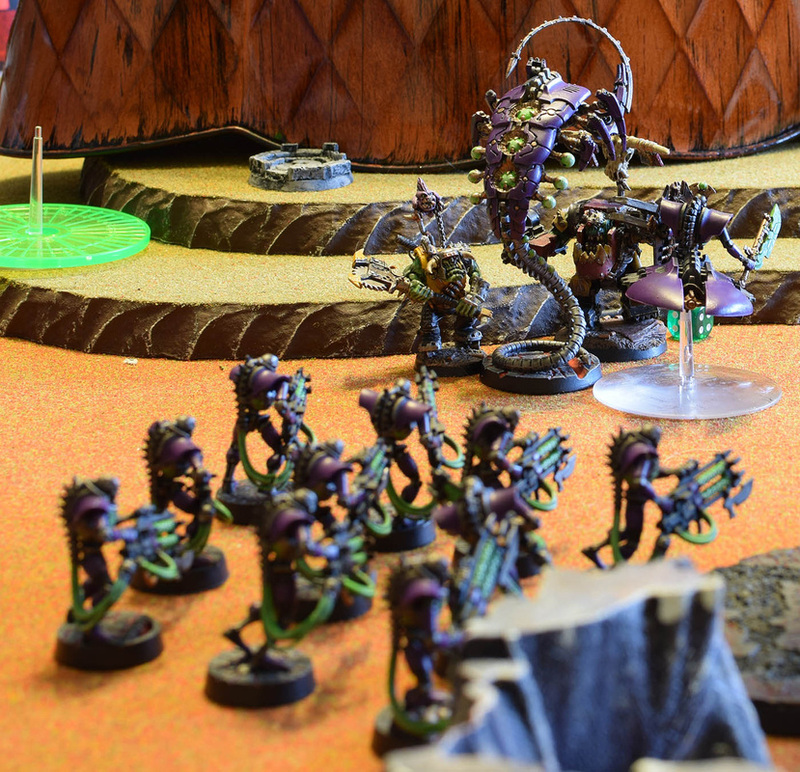 The meganobz charge into the wraiths. 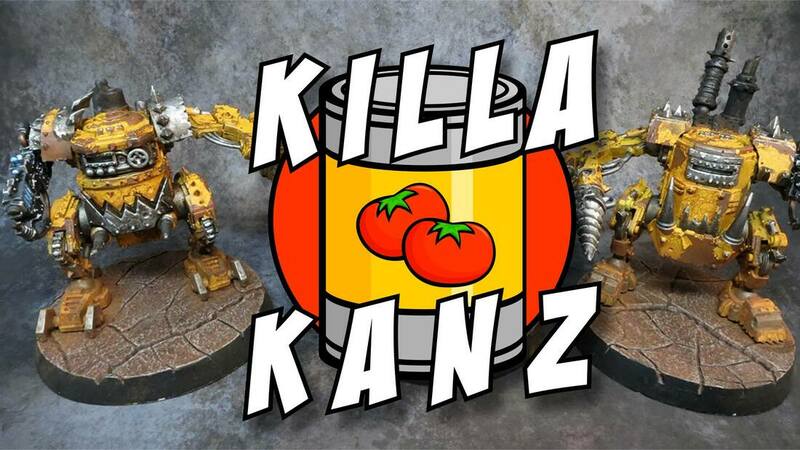 They make the orks init 1...but power claws are init 1 anyway. I don't challenge. He doesn't challenge back. I lose a nob to combat before I even get to swing. (deadly warscythe). Warboss also takes a wound. The meganobz swing back and wipe out multiple wraiths with instant death. Macathu makes a ton of saves though. That 3++ is crazy. 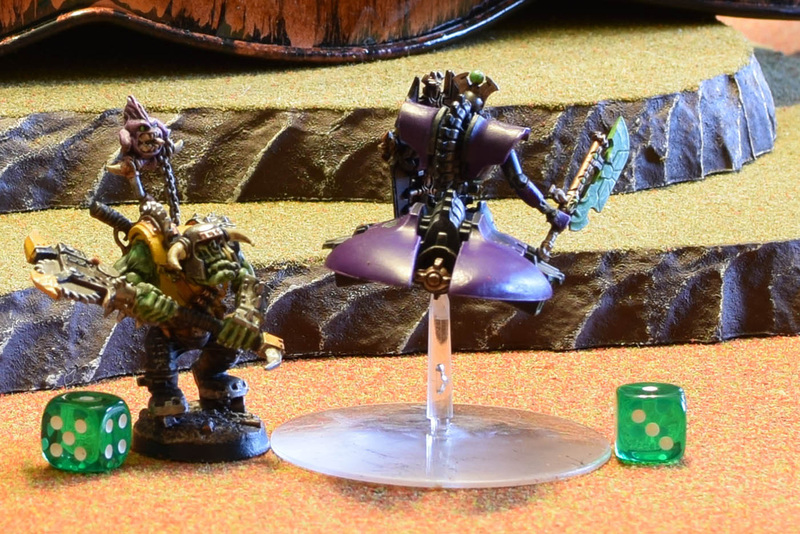 Orks win combat, but wraiths are fearless. I charged the meganobz into the wraiths, hoping to wipe them out with 25 power claw attacks, so the lord would be forced to take an LD test. Macathu is insane at making wraith saves. He only failed three of them. Every single Night Scythe comes in at once. 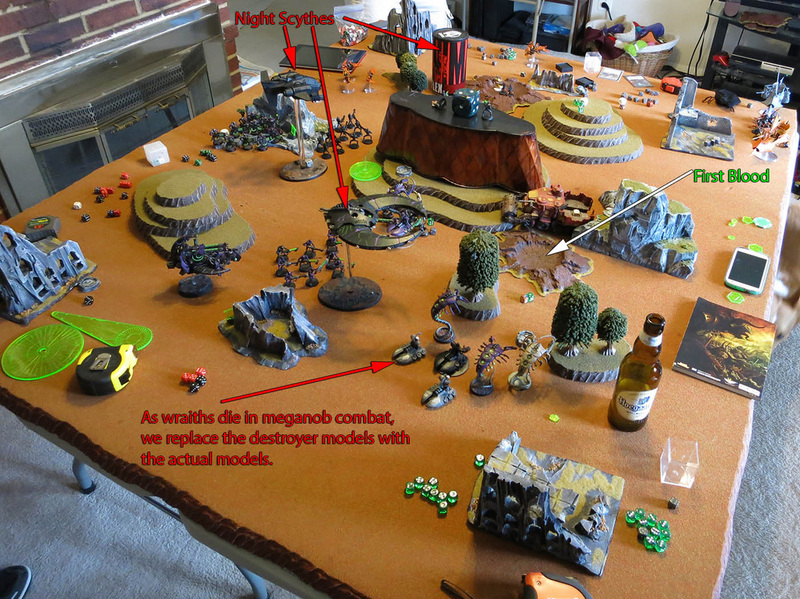 The night scythes come screaming onto the board, and immediately drop their cargo of thirty immortals. The amount of fire power just unleashed upon the board is staggering to say the least. The deff dread explodes from the combined fire power of the night scythe and barge. 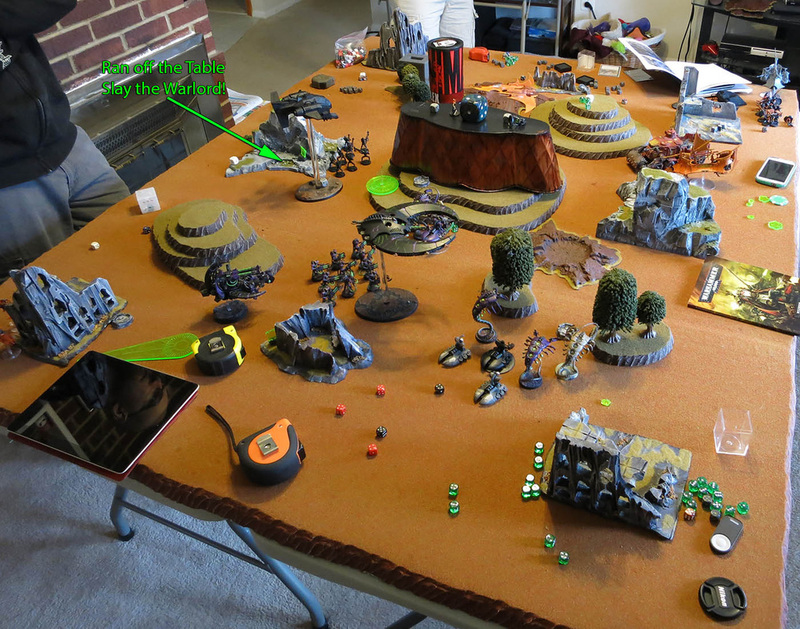 (First blood) The gauss immortals fail to do anything to the battlewagon. Combat continues with the wraiths and destroyer lord. I challenge the lord with a nob. He accepts and I pass mindshackle, only to have the lord obliterate the nob with the war scythe. In return, I kill another wraith. Just one remains. The other group of wraiths are too far away from the battlewagon to reach it. Raiders exploding is extremely bad for the occupants. Dark eldar are very similar to orks in that regard. I think more of shantz troops were destroyed by his own (and my own) vehicles exploding then by any other method. The Razorwing, and Wyches come in. The other battlewagon and dakkajet do not. 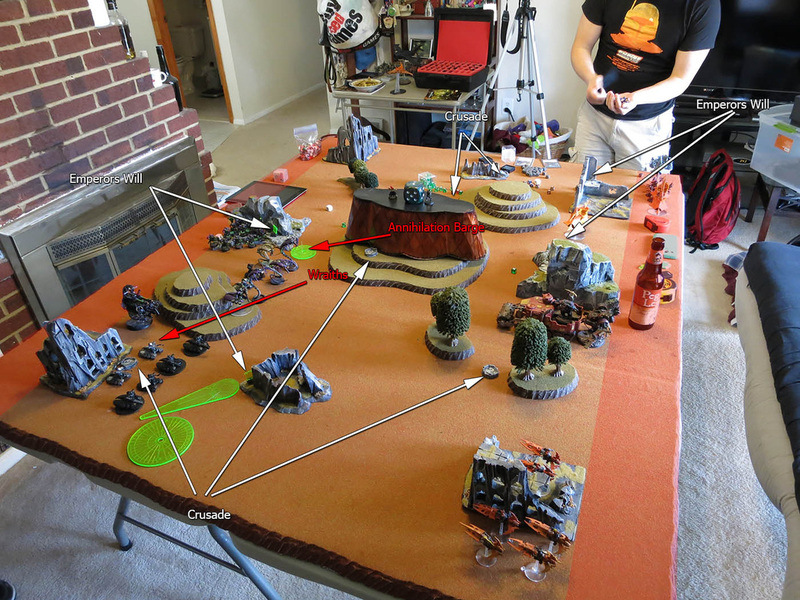 Shantz preps the archon to assault the nearby unit of immortals that dropped from the flyer. The wyches move on in their flyer to help hold rear objectives. The razorwing zooms up to engage the unit of immortals shooting at his bikes. Shantz drops his webway portal. The razorwing unloads on a group of immortals, kills one or two. The battlewagon snapshots and hits nothing. The wyches raider fires and misses. The bikes vent their furious anger, and hit the unit of immortals with the lord on the main emperors will objective. 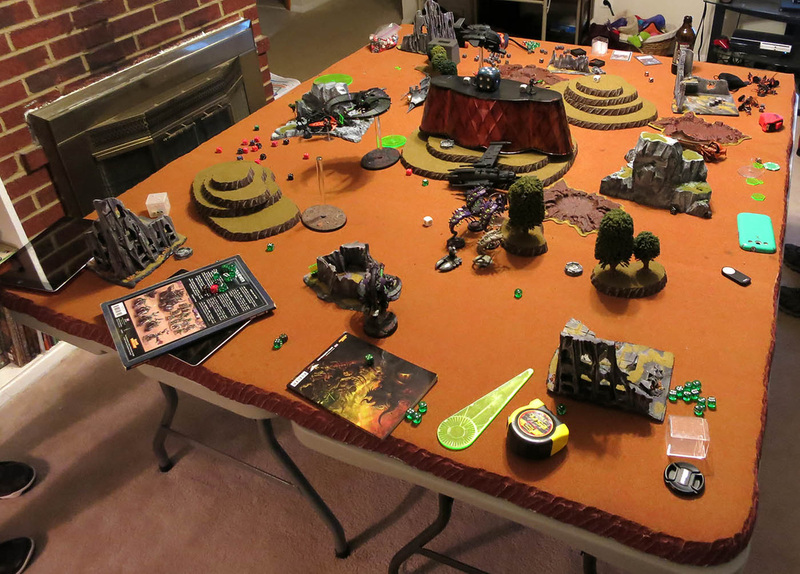 They kill enough to force a pinning and morale check. They pass their pinning check. Macathu rolls a morale check...it's an 11. They fall back off the board. Warlord kill! Another nob falls in combat. The wraith makes his saves. Not looking good here. The warscythe not being unwieldy makes it extremely powerful vs powerclaws. I was really hoping this combat would have ended swiftly, so the meganobz could engage another target. 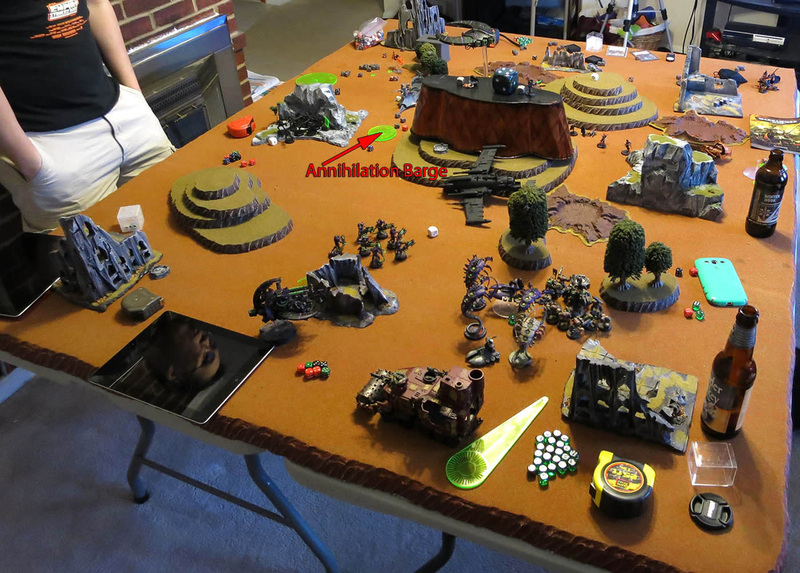 Shantz assaults into the unit of immortals with his archon and a few warriors. The warriors take some overwatch hits, but Shantz makes it into combat through difficult terrain. The archon does massive damage with his huskblade, and sweeps the entire unit! 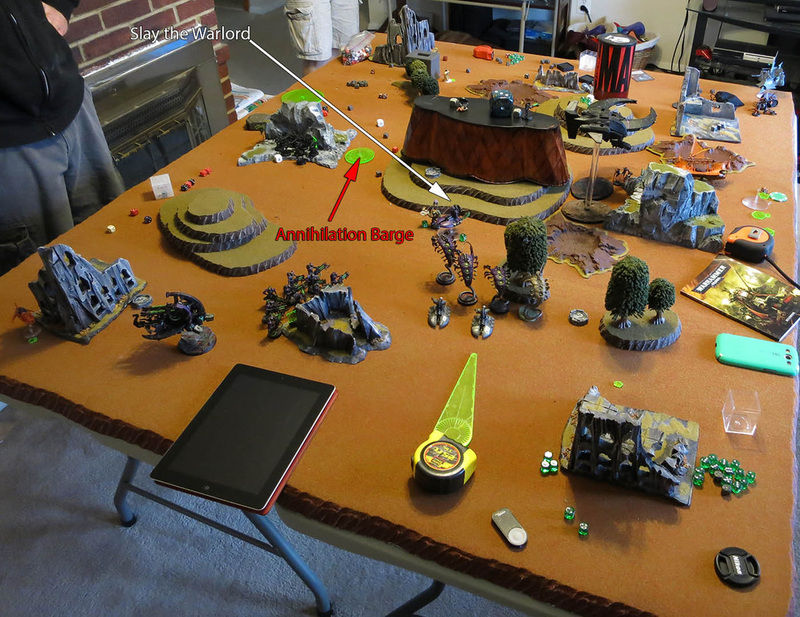 One of the annihilation barges, and the immortals shift to engage the bikes that just wiped out the overlords unit. 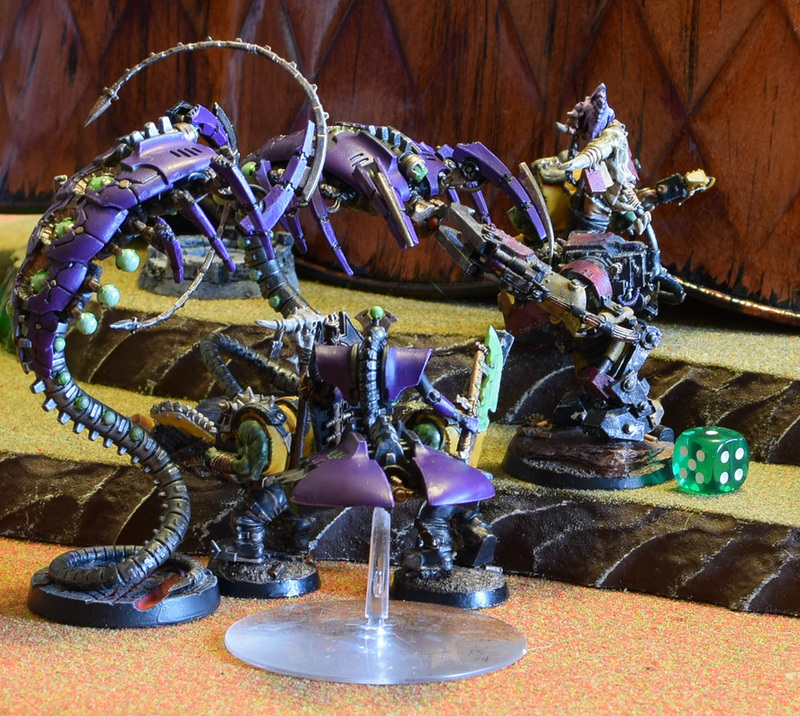 The wraiths swing up to assist their lord in combat. The other annihilation barge moves up to provide blocking for any forces coming out of the webway. 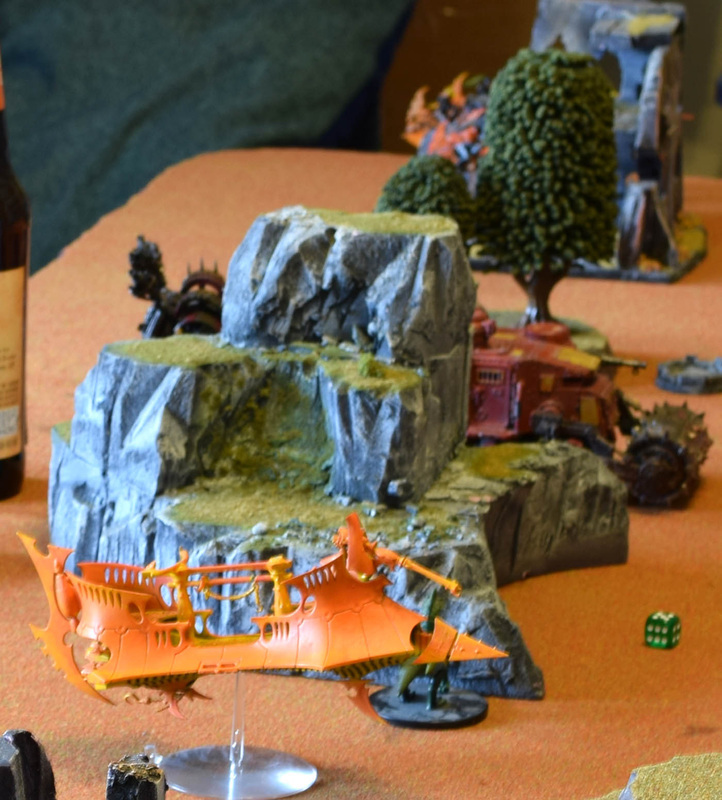 The annihilation barge knocks the razorwing out of the sky, while combined fire from the immortals and second barge kill all but one bike, who passes leadership. We ran out of craters. That's how devastating the necron firepower was. 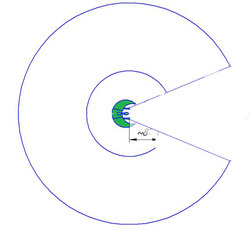 We had a discussion later, which pointed out that we were giving the hull mounted flyers 90 degree fire arcs (45 degrees in either direction), when it's supposed to be 45 degrees total from center. (up/down/left/right) As such, all the flyers had giant firing arcs, when they shouldn't have been able to engage all targets. 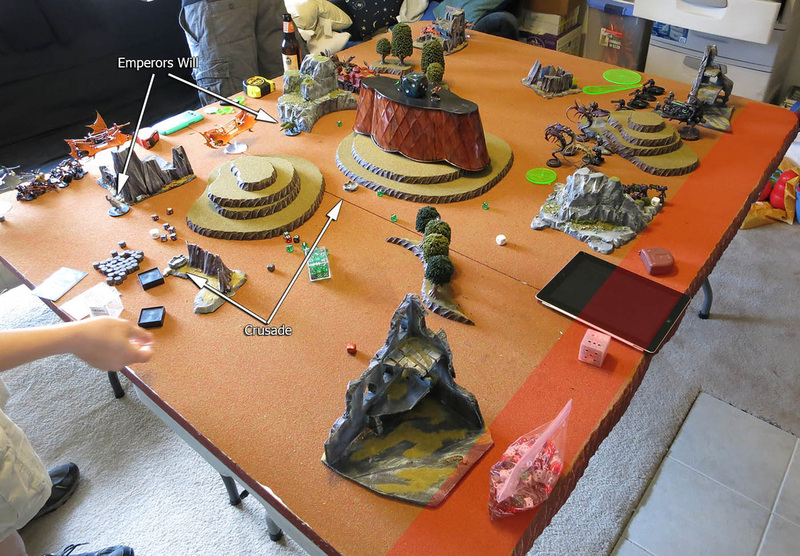 We are adjusting this for future battle reports. The ravager, dakkajet, and battlewagon/shoota boyz come in. Shantz pops the ravager out of the webway (we now know this is an illegal move. We didn't know you can't bring vehicles out. The webway is now completely useless :( ). 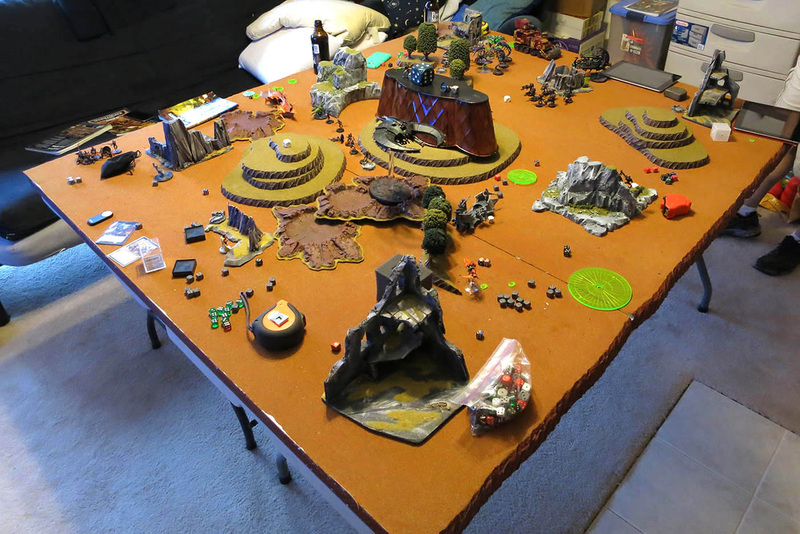 The wyches spread out a bit to try and get two different objectives. 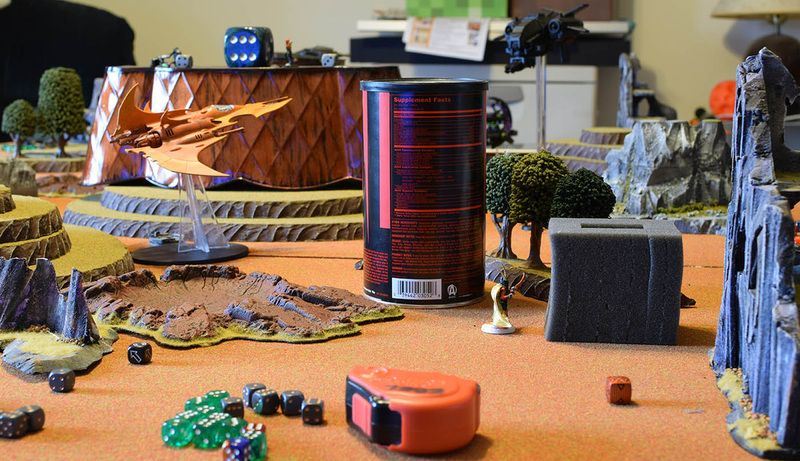 The dakkajet fires 18 TL super shoota shots at the immortal group, and kills 2. The ravager fails to pen with three dark lances. The last nob fails mindshackle and kills himself because he has no one else worthy to fight :). The destroyer lord consolidates towards the battle wagon. Hide little bike hide! You are our only hope. Mercifully, two of the three flyers leave the table. 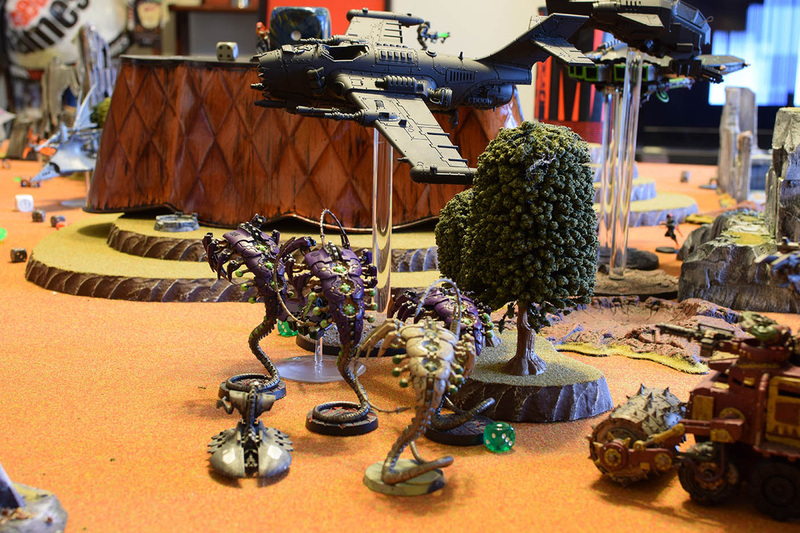 The wraiths move to surround the battle wagon. The destroyer lord joins them. 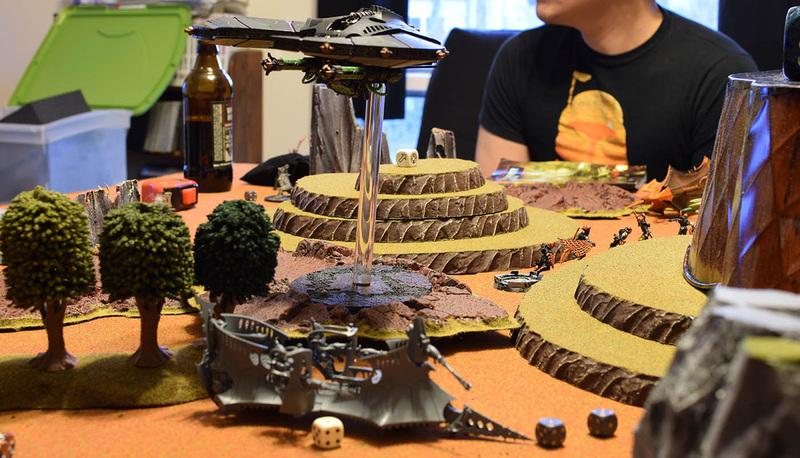 The annihilation barge points to engage the dakkajet. 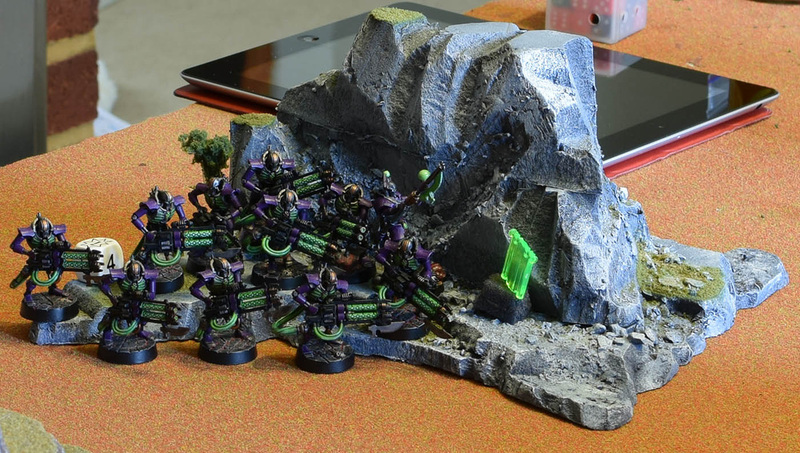 The immortals move to support the surrounding units. 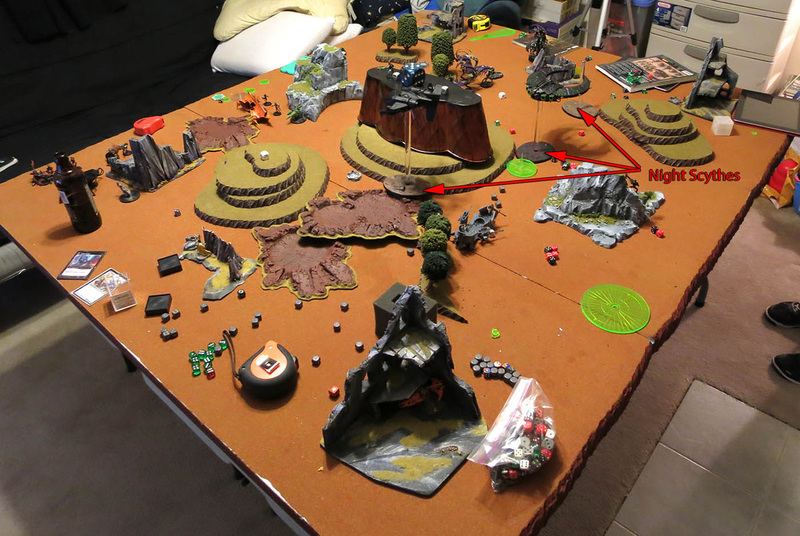 The back immortals move behind cover on their objectives, while the last night scythe turns north to get some shots on the ravager. The first barge destroys the dakkajet without even trying. 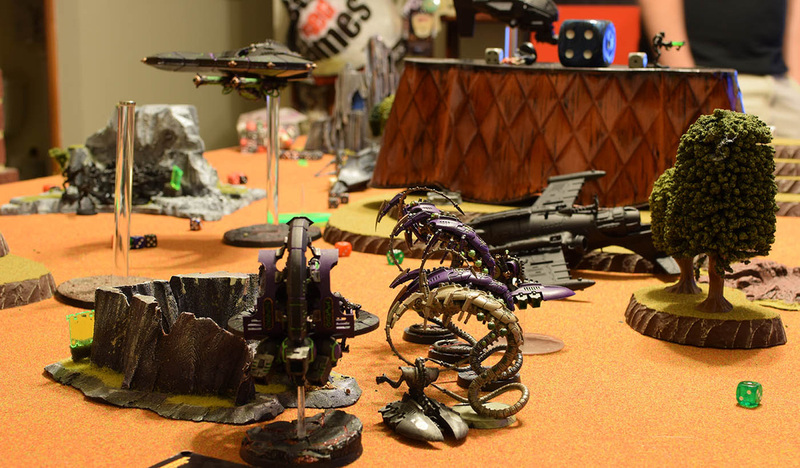 (that's what I get for not painting it) The second barge gets a glance on the ravager. The immortals might have put a hull point on the battlewagon, but it's still going strong! The night scythe finishes the ravager off. 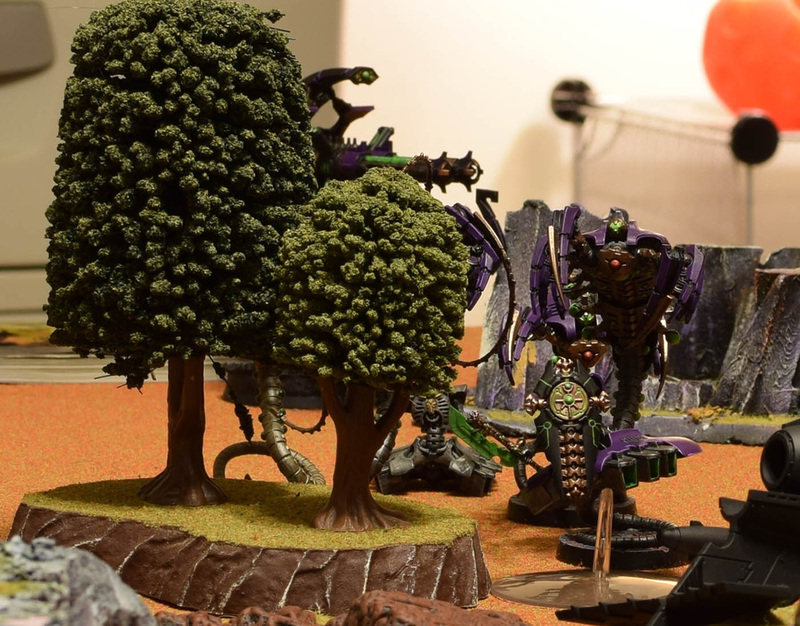 The destroyer lord and wraiths assault the battle wagon. Macathu lets me have 50 overwatch shots (as i forgot to take 10 last turn). It doesn't have any effect. 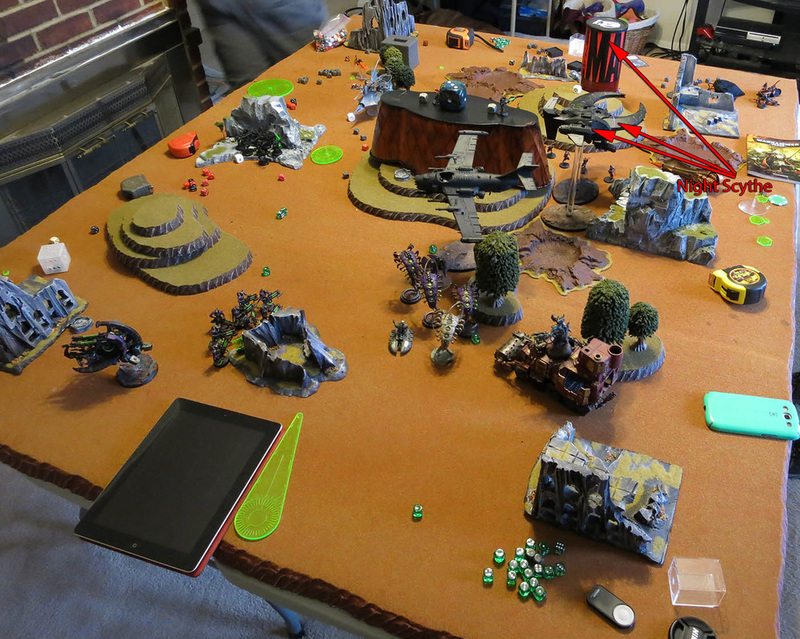 As expected, the battle wagon explodes, and 6 orks die in the explosion. The orks are still fearless and pass their tests. We are running out of options. We don't have anything that can handle any of the necron units on the boards besides troops at this point. 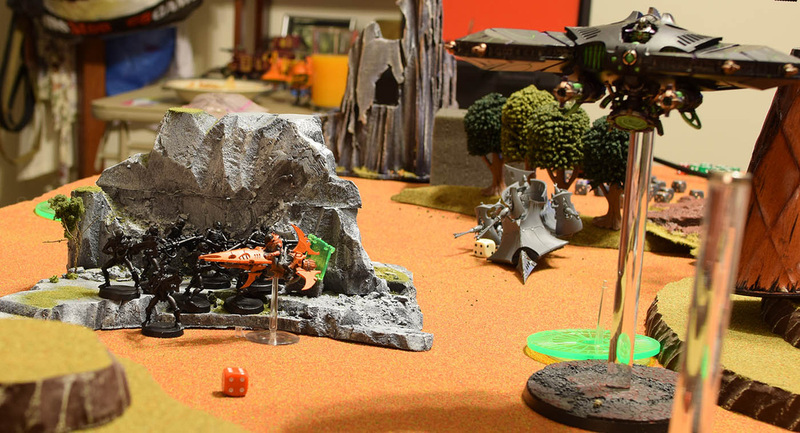 The lone reaver jetbike zips into hiding in the far corner for a end game plan. I decide not to shoot. I want minimum charge distance. None of our other units can shoot anything. I think the wyches yell curses. I need a 6 inch charge...and make it! 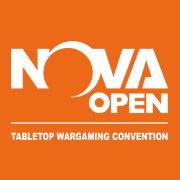 The nob takes a wound due to overwatch, but the orks make it into the immortal group. Suddenly remember why I love orks so much...even the shoota's lay down an impressive 10 wounds...followed by the warboss and nob basically wiping the entire immortal squad. Three troops down, one to go! The orks dive into the nearby cover. All the flyers come back on. One decides to take out the wyches. 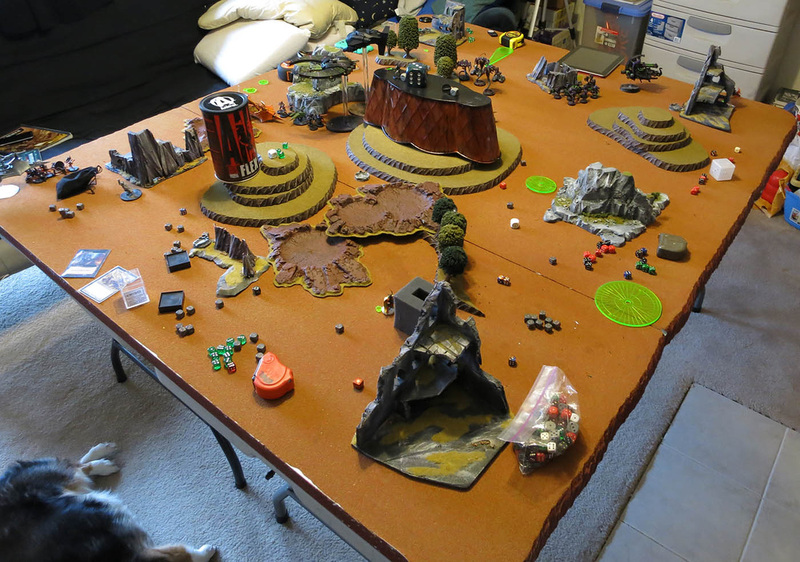 The rest of the board decides the orks must die. 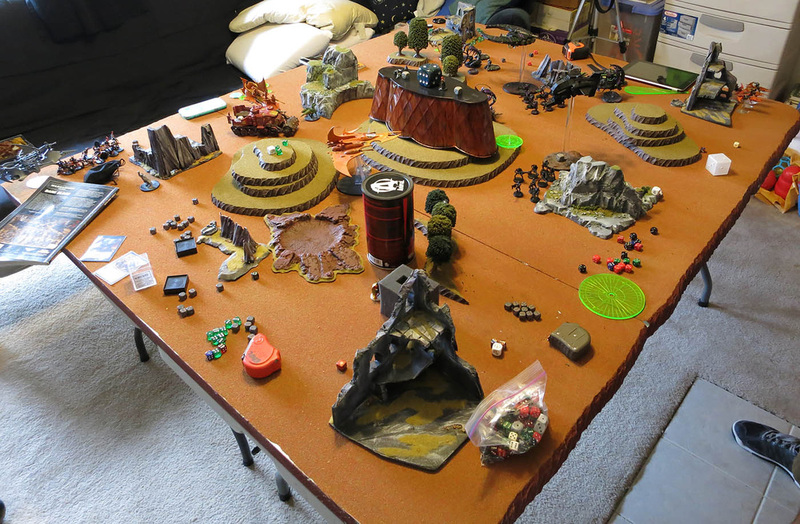 The orks are obliterated (even in cover). The amount of firepower from two barges, and two night scythes is impressive to say the least. 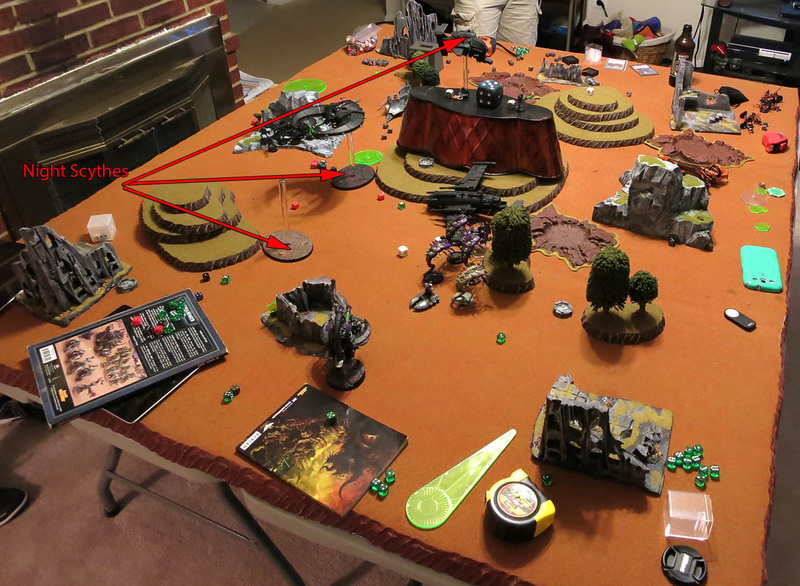 The other night scythe kills three wyches, and forces a morale check. They fail and fall back. No assaults. The ork spores start making their way into the upper atmosphere. Only chance for a win is snake eyes on the leadership roll of the wyches. Shantz rolls for the wyches leadership. They fail and fall off the board. He then moves his bike to contest emperors will in Macthu's backfield. 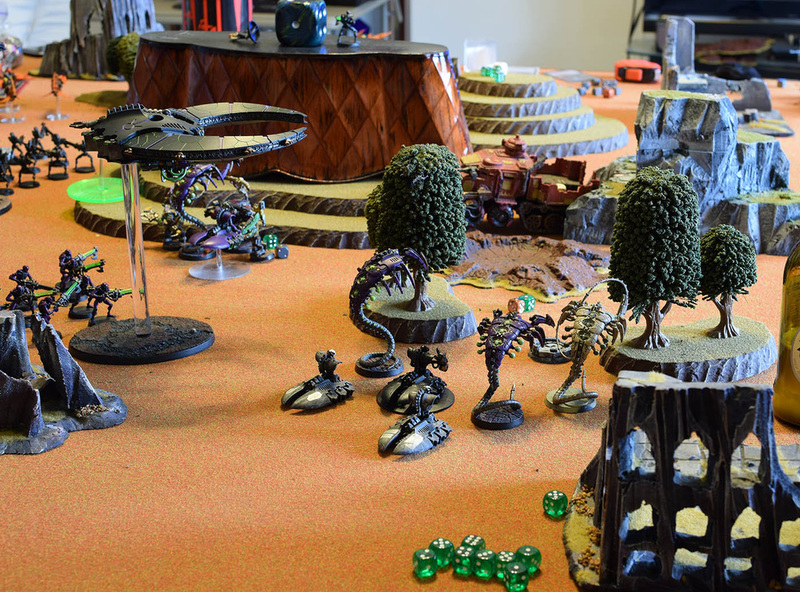 The dark eldar reaver drops some pain on the immortals, who shrug it off. You can do it Dark Eldar Reaver! You can DO IT! And here at the end...we are tied on tertiary, no one has secondary, and no one will have primary if the game doesn't continue. 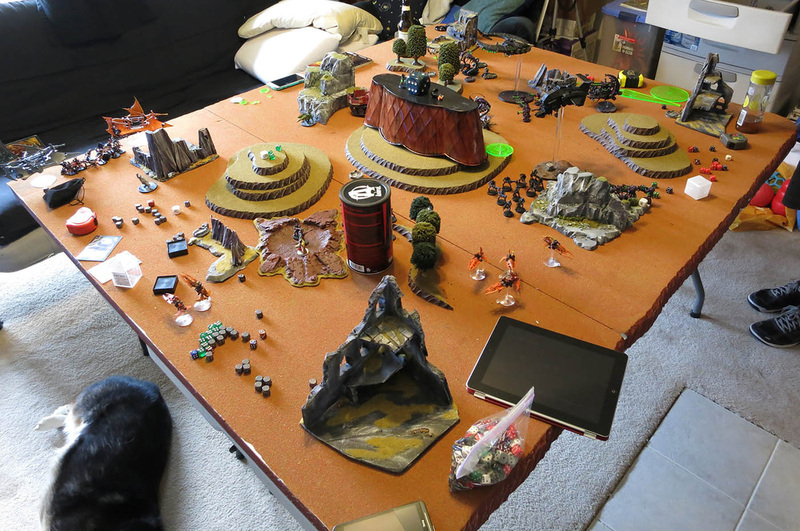 We concede as there are only two units on the board, which he will quickly table. 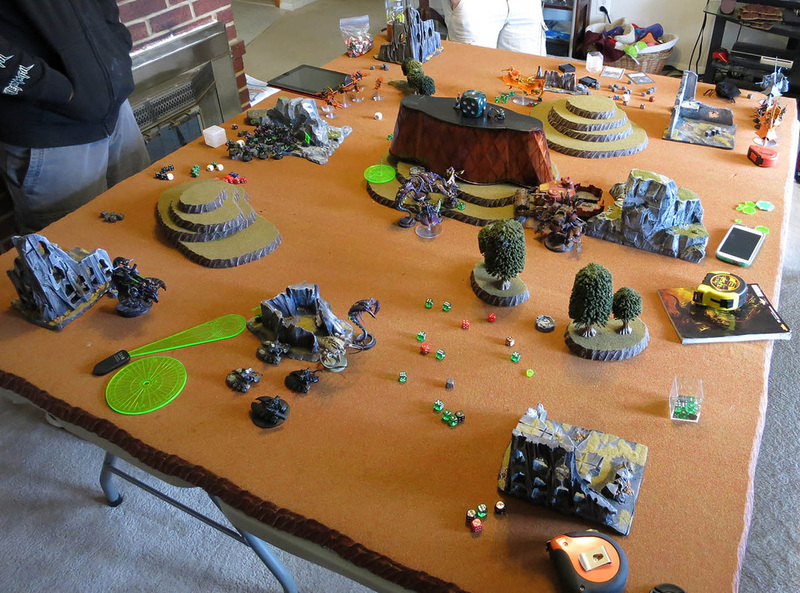 Ork and Dark Eldar are tabled due to no units left on the board. Total and Overwhelming Victory for Necrons. 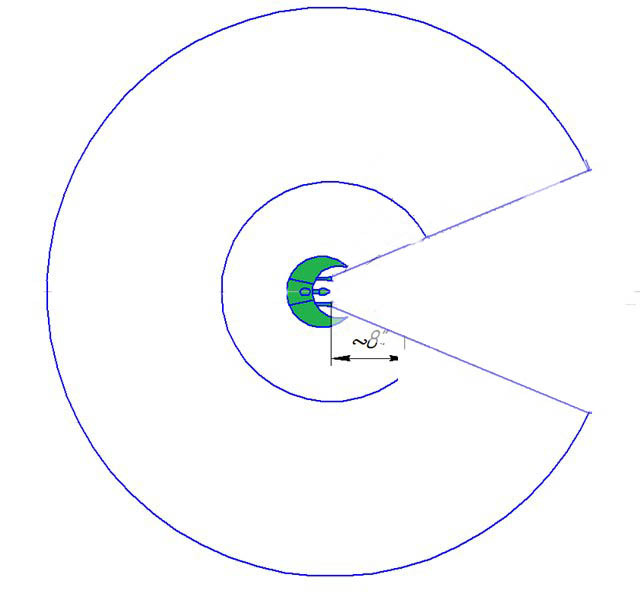 Firing arc of the flyers hull mounted weapons. I was under the impression it was 45 degrees in either direction, it's actually 45 degrees total, which is far more restrictive. I blantly stole this image from the internet, and then modified it to show the actual firing ark of the tesla guns. Forgiveness please if you made this image. I'll give credit if I could figure out who did it! Don't allow vehicles through them. What is the point of these things now? Objectives must be in your deployment zone. With such low points, I won't bring such a low model count ork army. I'll probably run some loota's, more boys, a quad gun, and another dakka jet. I'd still run the meganobz, mainly because they are always awesome :). Will probably see the orks in the next battle report as well, as I want to get a few games in before the codex gets overhauled. Thanks for stopping by and reading! If any have any suggestions or noticed something we did wrong, please leave a comment.